Hishon was a surprising pick. Who's next? 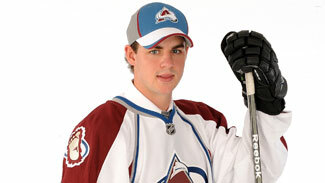 Last year, the Avalanche shocked the draft by selecting center Joey Hishon with the 17th overall pick. Hishon was ranked 55th by the Central Scouting Service and many believed that the Avs had gone too far off the board with the pick. Now, however, Hishon looks like a real steal for Colorado, as he put together an extraordinary season for the Owen Sound Attack in the Ontario Hockey League. Rick Pracey - head scout for the Avalanche - has stated in the past that Hishon wasn't much of a reach for the Avs at all. "He wasn't off our board," Pracey said. "Our board had him very high, based on his skill set. There are certain traits we use in our evaluation of players that are very important to us, and compete, skill and instinct are major components. Joey fit the bill. Opinions are varied, depending on which list you're looking at, but for us it was right on pace." With the 2011 Draft right around the corner, it's time to ponder who the Avs will take with the #2 and #11 pick. A bunch of names have been floating around - Landeskog, Huberdeau, and Larsson to name a few - and it seems that every "expert" has a different take on who Colorado will/should take. But The Avs Factor has received inside word that the Avs - always an organization that has valued secrecy and silence - may be defying conventional wisdom yet again and going way, WAY off the board with their first round picks. The following are quick profiles of the players that appear to be very high on the Avalanche's list of "must-have" talent. If everything falls into place, we may very well see one of these guys in burgundy and blue next season. A real up-and-comer from Louisiana's rec. league program, Simmons has the size, the dedication, and the tenacity to compete at the NHL level. A dermatologist during the day, Simmons drives a '92 corvette to ensure that he gets to all of his games on time. About to turn 59 next month, Simmons' best days may still be ahead of him. Scouts have compared Simmons to an older Wendel Clark, and many believe that that he will eventually be capable of earning a letter on his jersey. One scout opined, "Hell, he's old enough to have seen Stan Mikita play. If that doesn't give him the ability to lead, I don't know what does." There are concerns about Simmons' life outside of the game, specifically his weak knees and a stack of bills that need to be paid. After getting cut by United States Curling before the 2010 Winter Olympics, Lansing responded with a monstrous season in the renowned Detroit Curling Club. He led his team to a 10-2 record (though he did miss three matches in order to make his bowling league) and also won first place in a weekend tournament towards the end of March. Now, Lansing is ready to move on to a new challenge. In an interview with his local paper last month, Lansing stated, "I figure that both games are on ice, and they both involve discs of some sort. How hard can it be?" Scouts admire Lansing's on-the-spot decision making and his ability to work well with others. Lansing says that he's not worried that he's never actually picked up a hockey stick. He maintains that brooms are close enough. Despite his apparent inexperience, one onlooker believes that Lansing may have already surpassed highly-touted Gabriel Landeskog in terms of draft rank and career potential. "With Landeskog, you have a kid with a lower ceiling than most of the top-end guys. But with Lansing? He hasn't even begun to realize what he might be able to do." "Baby Cheeks Bobby" has been labeled a "long-term project" by scouts, but a handful of teams believe that the floor hockey phenom may be worth it. One league observer said he's been following Cooper for awhile now. "I was there when he took his first steps and when he was potty trained. Just last week, I was there for his kindergarden graduation." The lack of stats for the youngster may scare some teams away, but the California YMCA is known to be a breeding ground for future success, producing such talent as 2010 Anaheim draftee Emerson Etem and famed rapper "Coolio." Cooper played all over the floor this season, and he became the team's main post-game snack provider. Teammates rave about Cooper's stickhandling skills, as well as his Mom's brownies. "They're really good. She puts M&Ms on them sometimes," blurted Cooper's teammate and classmate, Sam Jones. Cooper says that he models his game after Alex Burrows, in the sense that he is also a thumb sucker. "But only my own thumbs," says Cooper. Of course, there's no guarantee that the Avs will go after any of these hot prospects. But if last year is any indication, it wouldn't be a surprise. Note: Players mentioned above may or may not be real.